Malta | ESCKAZ.com live from Lisbon! I think there's some appeal with Malta. But in minority on that. Bit problematic that the led screen installation covers her from camera too often. This needs work but it's more polished than nf. Gimmicky of course but here it needs it. One of the most spectacular performances visually. Christabelle stands between four walls that have many projections on them, or they may even be led screens that they brought. Just to name a few things that we see in there, the captives in white from the video, a black panther..
Later on we see a dancer in the box, visualizing the echoes in her head. What I like about this performance is that even though the song is quite upbeat Christabelle is not jumping around but rather has a slow choreography. It sounds ok for a first rehearsal, she seems to be holding back a bit for now which of course is a perfectly logical thing to do with many more performances coming up. Claudia Faniello, would like to thank you for taking the time to come to her Press Conference, Meet and Greet and interview her. She is very grateful for all the support you showed to her so far and hope that you will continue to support her through Semi final 2. 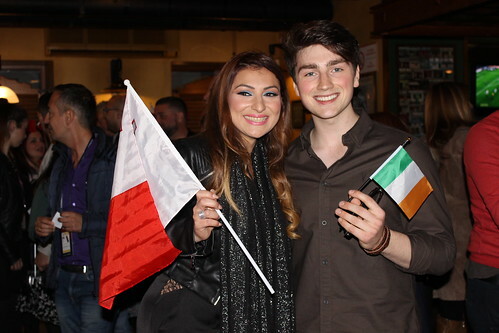 The performance from Malta is also largely the same as a few days ago during the first rehearsal. The backdrop starts with a waving piece of fabric, that is later revealed to be the dress Claudia wears on the backdrop. The visuals seem to be largely the same which means her chest is visible for quite some time in the hall, more than on screen where I already noticed it last time. This makes it all very tempted to give this song a new title (obvious?) but I will resist for now. On stage it's still the same dress as we saw a few days ago. As the song continues towards the second chorus the backdrop shows more and faster movement, in line with the added instruments in the music. The vocals are just excellent every time, and gather the largest applause of the day so far. Goosebumps. Claudia with another passionate, heartfelt and vocally flawless rehearsal. Unfortunately it feels like very long three minutes, as the song is just a little too predictable and doesn't provide any layers of depth like other Ballads we heard from Finland, Portugal etc. But those are in the other semi final, which might help Claudia out a bit. She would deserve it.